Rex Heflin, 1965: a Classic UFO Photo, now in 3-D! In Santa Ana, California on August 3, 1965, highway worker Rex Heflin got three photos of a supposed UFO out the window of his van, using his Polaroid instant camera. This series of photos has long been touted as a “classic” by NICAP and many prominent UFOlogists. This object supposedly flew right over the Marine Corps El Toro Air Station, plus the Santa Ana freeway (Interstate 5) in broad daylight, but no one else saw it. (Sheaffer 1998, p. 91-93). In these photos, distant objects are hazy because of the Los Angeles smog, while the UFO is not, probably because it is tiny, and very close to the camera. For many years the original prints could not be investigated, because Heflin claims that they were confiscated by an investigator who came to his house, flashing an ID supposedly from NORAD. At least Heflin did not claim that the Men In Black came for his prints, or that the dog ate them. He blamed NORAD. So all we had left were copies made from the originals. The Air Force's Project Bluebook listed the Heflin photos as a "hoax." However, "In 1993, Heflin’s Polaroid originals surfaced unexpectedly under mysterious circumstances." Heflin died in 2005. Dr. William K. Hartmann replicated Heflin's photos for the Condon report (case 52), using a suspended lens cap. Skeptics have argued that Heflin’s UFO appears to be a tiny model, just a few inches in size, hanging from something like a fishing pole propped up over the cab of his van. The RB-47 Encounter of 1957 - UFOlogy's Best Evidence? In the early morning hours of July 17, 1957, a U.S. Air Force crew aboard an RB-47, a plane loaded with the most sophisticated state-of-the-art surveillance and electronic countermeasures gear, reportedly encountered and was followed across several southern states by one or more UFOs, seen visually as well as on radar. Some UFOlogists consider this the best UFO evidence of all time. It was investigated as Case 5 of the University of Colorado's Air-Force-sponsored Condon Report, which cited the absence of an official report supposed to have been written on the incident, and concluded "Evaluation of the experience must, therefore, rest entirely on the recollection of crew members ten years after the event. These descriptions are not adequate to allow identification of the phenomenon encountered." 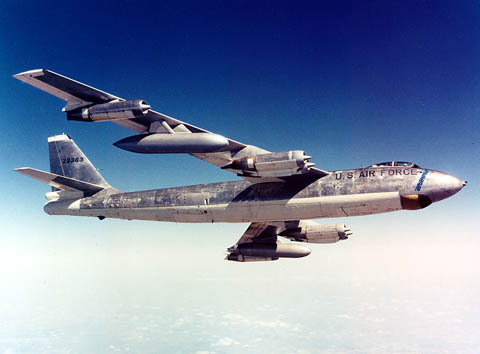 A U.S. Air Force RB-47, carrying then-state-of-the-art electronic surveillance and countermeasures gear. 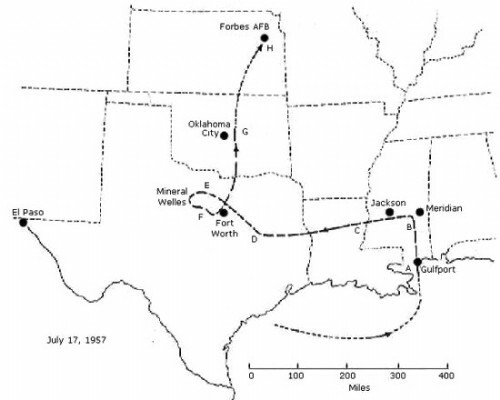 The UFO Casebook says, "An Air Force RB-47, equipped with electronic countermeasures (ECM) gear and manned by six officers, was followed by an unidentified object for a distance of well over 700 miles, and for a time period of 1.5 hr., as it flew from Mississippi, through Louisiana and Texas and into Oklahoma. "The object was, at various times, seen visually by the cockpit crew as an intensely luminous light, followed by ground-radar and detected on ECM monitoring gear aboard the RB-47. "Of special interest in this case are several instances of simultaneous appearances and disappearances on all three of those physically distinct "channels," and rapidity of maneuvers beyond the prior experience of the aircrew." There is a brand new in-depth investigation of this case by Tim Printy, just published in his WebZine SunLite, January/February, 2012. It is one of the most complex cases in all UFOlogy. I cannot possibly give more than a brief summary here; Printy's analysis runs over thirty pages, and is enormously significant in the history of this major case, and thus in the ongoing debate over the reality of UFOs. Printy begins by making what is, to me, a crucial observation: "It does seem rather odd that the UFO would decide to use an S-band radar signal to track or test an Air Force RB-47. It is this clue that seems to have been glossed over/down played by those presenting this case as the best evidence." In other words, the UFO seems to have been sending out (but only in this case) S-band radar signals with exactly the same characteristics as those used by the U.S. Air Force at that time. How strange is that if the UFO is sending out exactly the same kind of radar signals we do? So isn't it likely, then, that the source of the signals was not an extraterrestrial craft, but instead a misidentified terrestrial one? The path of the RB-47 during its supposed "UFO encounter." Printy notes how the late atmospheric physicist and Ufologist Dr. James E. McDonald interviewed the RB-47 crew and wrote a paper on this case. "McDonald’s stamp of approval had immediately made this case a “classic.”" The famous UFO skeptic, the late Philip J. Klass, "took on the case in 1971 and wrote a rather extensive study on the incident. Klass suggested that it was equipment malfunction, a bright fireball, an airliner, and reception of ground radar signals that made the event appear mysterious to the air crew." This analysis can be found in Chapters 19 and 20 of Klass' 1974 book UFOs Explained. In the 1990s, UFOlogist Brad Sparks, who styles himself as "the “RB-47 expert” in his email address, re-evaluated the case. Sparks concluded that Klass had erred, most especially in asserting that the RB-47 had, because of an equipment malfunction, erroneously picked up signals from the radar station at Kessler Air Force base in Biloxi, Mississippi, which was a training facility for radar operators and repairmen. That radar, said Sparks, was not operating at the time of the incident! Sparks wrote, "Since it was a nine-month course it was apparently run during the normal academic term from September to June approximately. In other words, there would not have been a class in session to operate the CPS-6B even in the daytime, let alone nighttime, in the midst of summer vacation, on July 17, when the RB-47 incident took place." Sparks simply assumed that, since this was not during the "academic year," the training radar would have been turned off! But Printy looked into the matter very closely of whether or not the Kessler radar was operational at the time in question. He found (as he, a retired Navy submariner, already surely knew), that military training schedules bear no resemblance at all to those of colleges! In fact, Printy found that the Kessler facility had been operating at maximum training capacity in July, 1957, and that some classes were indeed scheduled between midnight and 6AM. Overall, Printy found that while Klass' analysis contains some errors, his overall conclusions still stand. If you have any interest in the RB-47 c ontroversy, or if you want to read one of the very finest research papers ever published about any UFO case, then I encourage you to read Printy's paper, and come to your own conclusion about this important and controversial UFO case.